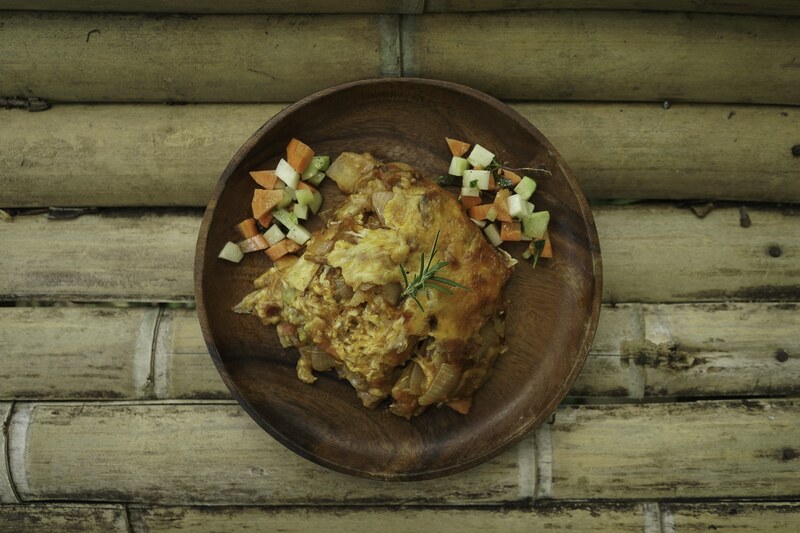 Share the post "Not Your Nonna’s Lasagna"
Living in the middle of a tropical food forest creates unlimited opportunity for culinary creativity. 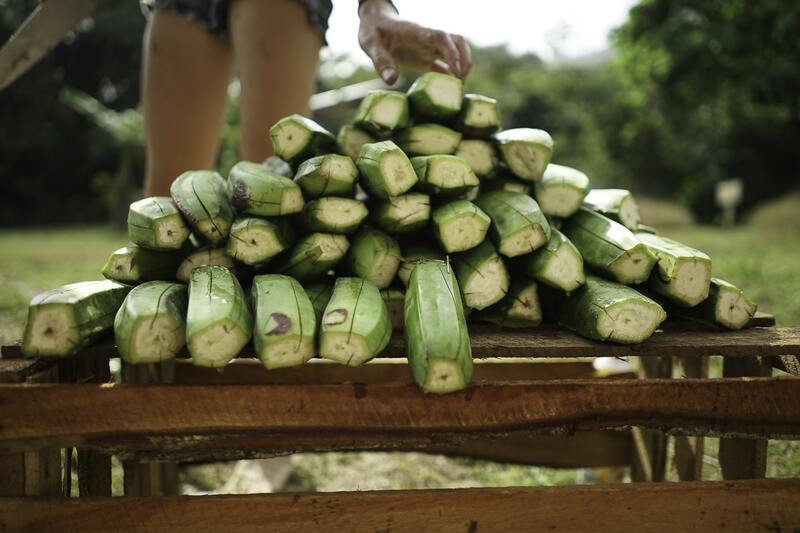 Through the right mix of experimenting and risk-taking, Kalu Yala Chef Brigitte Desvaux has become somewhat of an expert in incorporating unexpected jungle ingredients into her favorite recipes from home. Her famous plasagna is the perfect example. 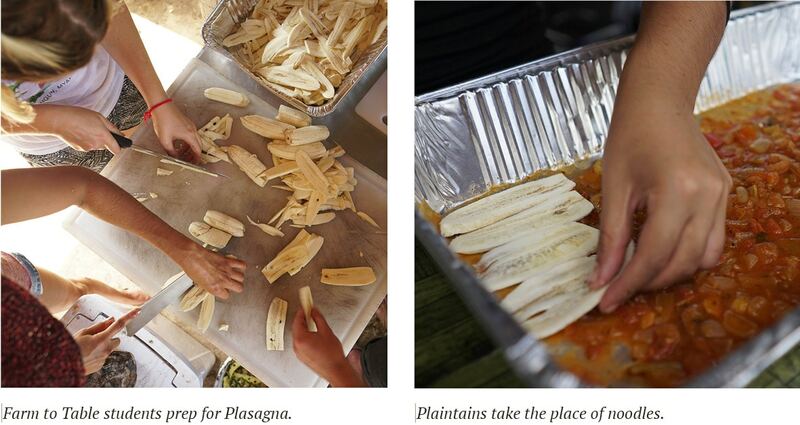 Who would have guessed that a plantain makes an excellent substitute for noodles? Here, Desvaux layers the fruit with homemade ricotta cheese and a pesto sauce made from fresh basil and moringa. It’s your childhood lasagna with a kiss of the tropics. Learn how to make your own below. Step 1: Peel all of your plantains and thinly slice them the long way, the thinner the better. Set them to the side. For easy peeling, place your plantains in boiling water for five minutes. They should then slide right out. Step 2: Combine one clove of minced garlic, five finely diced onions, oregano, basil, thyme, rosemary, moringa, salt, pepper (all to taste), and lemon or lime juice into a separate bowl. Then transfer into a blender and blend until all ingredients are well mixed,adding olive oil for texture until it becomes creamy. Next, put in a sauce pan on medium heat until it comes to a subtle boil, stirring regularly. Step 3: If you’re including any additional vegetables of your choice to this dish, this would be the time to grill those up. Step 4: Spoon a thin layer of sauce into a deep baking pan, spreading over at least the entire bottom. Cover with a full layer of sliced plantains. Adjust accordingly to fit, overlapping is okay. Add another thin layer of sauce, again covering all of the plantains. Cover sauce with grilled vegetables if you opt to include them in your recipe. If not, add another layer of plantains. Next, spread a generous layer of ricotta cheese atop your grilled vegetables or plantains. Repeat the process of sauce, plantains, sauce, vegetables, then cheese until you have used all of your sauce and plantains. Step 5: Preheat your oven to 350F and cover your pan with tin foil. Once preheated, place pan into the oven for one hour. The plantains will be softened when the dish is ready. Buon appetito!